Dr. Waterman is your guide on your journey to optimal oral health. He grew up in West Hartford and attended the Renbrook School and The Loomis Chaffee School before going on to earn a B.S. in biology, with minors in chemistry and music, at Butler University in Indianapolis, IN. He received his Doctor of Dental Surgery from The Baltimore College of Dental Surgery (the world’s first dental school) and continued his education with a one-year residency in general dentistry at the St. Francis Hospital and Medical Center in Hartford, CT. Dr. Waterman was then fortunate enough to spend two years working for the Indian Health Service with the Navajo Nation in Arizona. 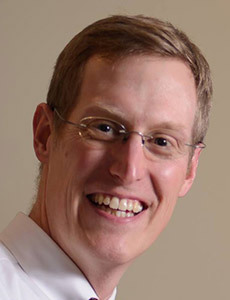 Since moving back to Connecticut in 2007, Dr. Waterman has worked in a variety of public health and private practice settings, providing comprehensive care to a diverse patient population. He is also an alumnus of the National Health Service Corps. Dr. Waterman has served as the co-chair for the Workforce Development Workgroup of the Connecticut Coalition for Oral Health, which strives to improve access to dental care for the people of Connecticut. His four daughters keep his wife and him busy shuttling around Connecticut from Middlefield where they make their home. Among other things, he enjoys singing, doing triathlons, and is always looking to learn new skills both at home and work.